Articulate Presenter 360 makes it easy to deliver courses to learners with tablets and smartphones. Here are answers to common questions about publishing mobile-ready courses. Should I include Articulate Mobile Player output when publishing Presenter 360 courses? When you publish to Articulate 360, Web, Articulate Online, or LMS, click the Formats property on the Publish window to open this Publish Formats dialog. After downloading a course to their Articulate Mobile Player, learners can view it at any time, with or without internet access. Presenter 360’s superior HTML5 output and new responsive player give learners the best viewing experience on tablets and smartphones, making Articulate Mobile Player (AMP) output unnecessary, unless learners need to download content for offline viewing or your course includes FLV videos with alpha-channel transparency, both of which are supported in AMP. Most features behave the same way in HTML5, Flash, and Articulate Mobile Player output, but some don't. 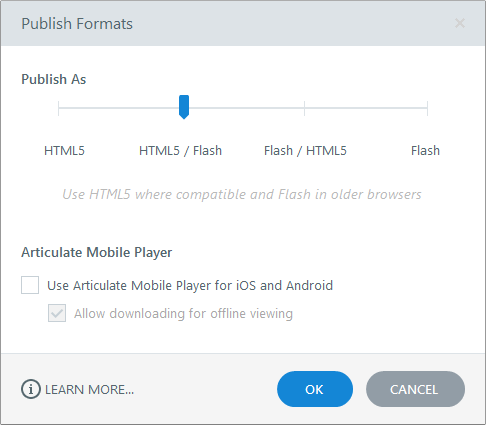 See this article for the expected behavior of each Presenter 360 feature in HTML5, Flash, and the Articulate Mobile Player. Open your web browser to your Articulate Review home page and click your course to open it. Upload your published course to a web server, then send learners a link to the presentation.html file. HTML5 courses published with Presenter 360 use the all-new responsive player when viewed on tablets and smartphones. See these responsive-player FAQs for details. Yes. Include HTML5 output and/or Articulate Mobile Player output when you publish. When learners launch your course, they’ll automatically see the best version based on your publishing choices. If you need to track learners' progress in an LMS, they must be connected to the internet. Otherwise, the course won’t be able to send data to Articulate Online or your LMS. The best way to track learners on tablets and smartphones is to include HTML5 output when you publish. Presenter 360 HTML5 output is supported in AICC, SCORM, and Tin Can API learning management systems (LMSs) as well as Articulate Online.